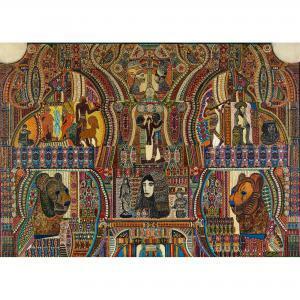 Find artworks, auction results, sale prices and pictures of Augustin Lesage at auctions worldwide. 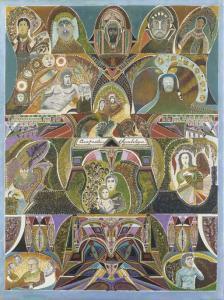 AUGUSTIN LESAGE (1876-1954) DEESSE NUT XVIIIe, CIRCA 1951 Huile sur toile Signée en bas à droite Titrée au centre 38,5 x 36,5 cm - 14.9 x 14.2 in. Signed lower right and titled in the center, oil on canvas Provenance: -Collection particulière Bibliographie: -Annick Notter, Didier Doroeux, Augustin Lesage: 1876-1954, Paris: P. Sers, 1988. Oeuvre répertoriée sous le numéro de catalogue 219 en page 214 de l'ouvrage. Illustrée en page 180. 48 x 37½ in. (127 x 95 cm.) Painted in 1928. 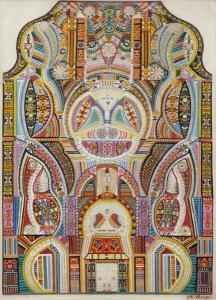 New York, Katonah Museum of Art, Private Worlds: Classic Outsider Art from Europe, December 1998-February 1999. Chicago, Intuit: The Center for Intuitive and Outsider Art, Eight From Europe: A Study Collection, April 2002-April 2003, (illustrated in color on announcement card). 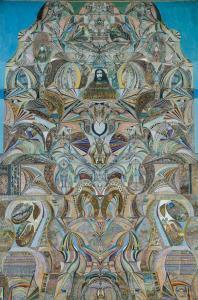 An important French visionary artist, Augustin Lesage began making his densely detailed works after an epiphany in 1911: "All of a sudden I heard a voice, a very clear voice, that said: 'One day you will be a painter.' I looked all around to see where the voice was coming from. There was nobody there. I was quite alone." Unlike many other Self-Taught artists, his works are art historically aware and are packed with reference to other cultures and religions, particularly Egyptian art. 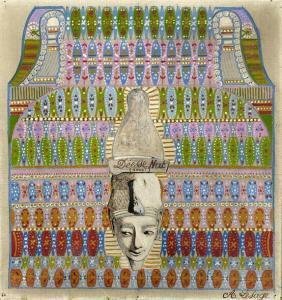 Indeed, he later contended that he was a reincarnated artist from the time of the Pharaohs. The obsessive amalgamation of saints and angels, presented with iconic frontality lends Composition Symbolique the feeling of a surrealist-imbued altarpiece.